Hi, remember me? Cheryl Cavanaugh? Wife, mother of 2 rambunctious boys, stay at home mom, and photographer on the side? Wow! I can't believe I've let so much time pass since the last time I posted. I could sit here and make excuse after excuse but the truth is......Life. Just. Happens. It has been a whirlwind of activity around here and I've hardly had a chance to take a breath. The more time that passed the more anxious I became about writing a catch up post. So much to cover!! Christmas, New Years, birthdays, an anniversary, Valentine's Day, and all the precious moments in between. And then I realized this is my blog. There is no reason to start stressin' when I step away for a little while. And why in the world do I feel like I have to play catch up when I've been MIA? Who said I had to? Bob. Bob the Bunny. Is he not the cutest thing you've ever seen! I've always said that this house is off limits to anymore animals until the cats die. Don't get me wrong. I love my cats and I don't want them to die anytime soon but they are a handful. I somehow always get animals with strange, off the wall personalities. 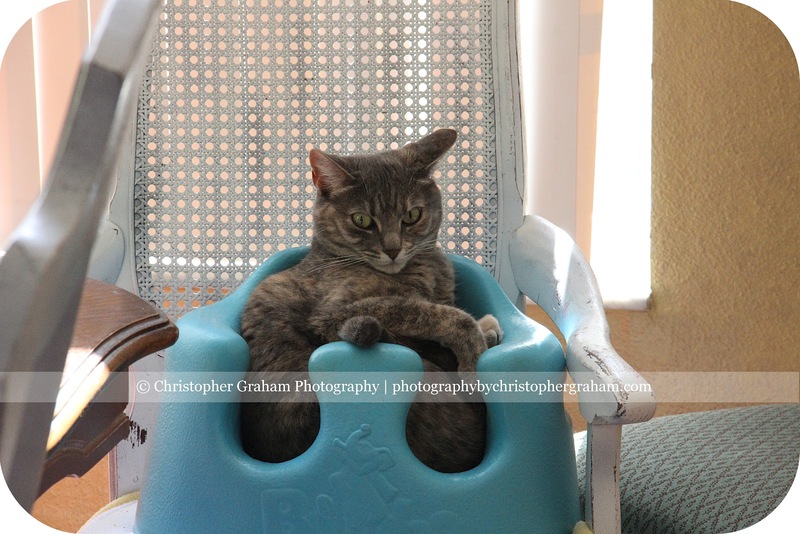 Chloe, my oldest cat, is a straight D.I.V.A. The world is hers and everything should go her way. She is overweight, likes to sleep on your neck, will bust a hole through all your window screens and knocks over any cup that has liquid in it. Then there's Galina our second cat. When Jacob was deployed and I was working all day, I thought Chloe was lonely at the house all by herself. One of my fellow teachers had a litter of kittens so I took one. My earth science students named her Galina after a mineral that produces a silver streak on an unglazed porcelain plate. Dorky I know but they were so excited when they came up with that name. I brought Galina home thinking Chloe would finally have a playmate and wouldn't you know they hated each other. They still hate each other to this day. Anywho, Galina is a bipolar cat on crack. She races around the house all day, literally climbs door frames, shower curtains, and will climb into tiny spaces that she can't wiggle her way out of. She is also relentless when it comes to stealing my husband's boot straps. So how did this rabbit come to live with us? 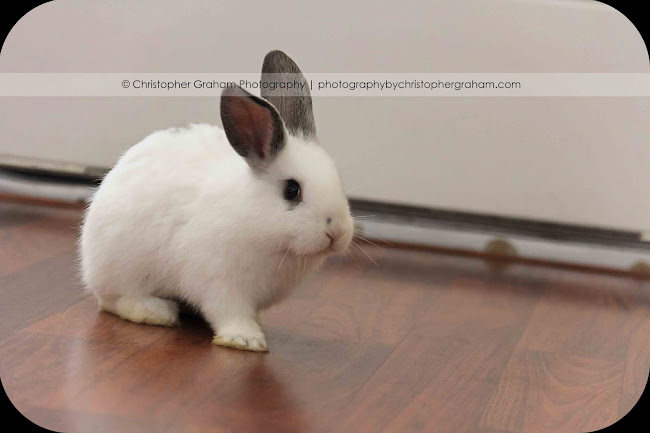 A friend of mine got a rabbit and once I saw it I was in love. 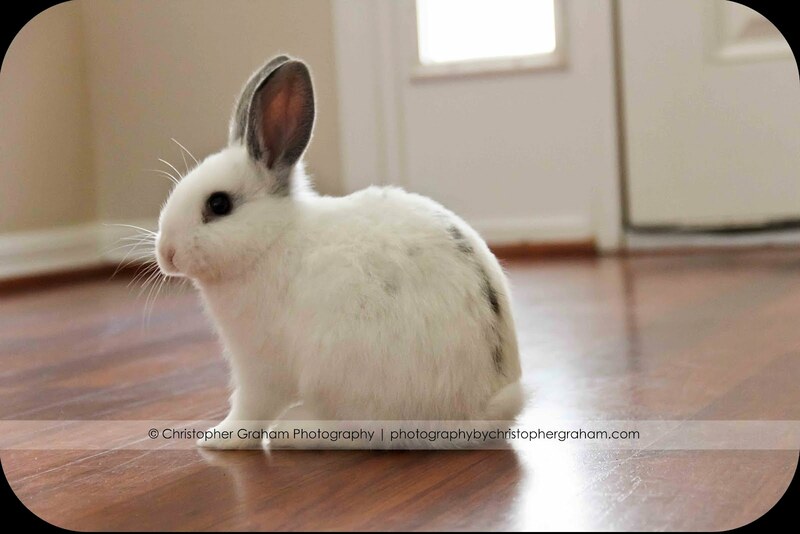 I never had a bunny growing up. Oh I straight jumped on it when she said she could get one for us. Her bunny is totally chill. He lies around, letting anyone hold him, stays in his cage and is just all around awesome. 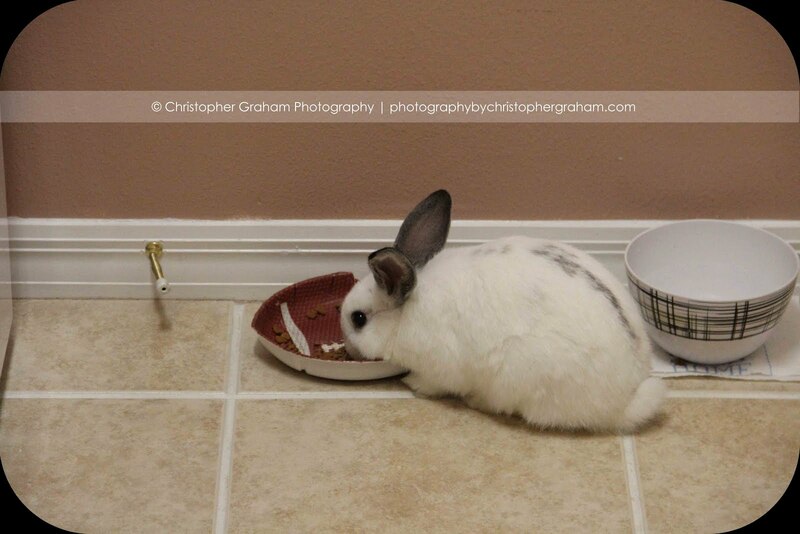 Why would my bunny be any different? They came from the same family right? So we started putting together his cage. 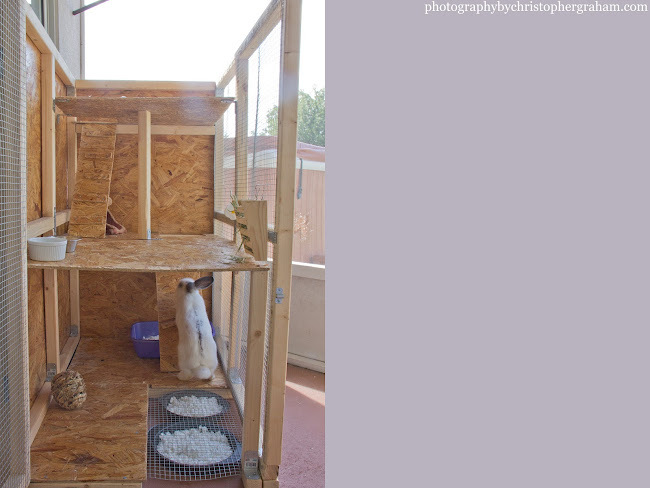 My friends had a great, inexpensive idea for creating the perfect rabbit habitat. 1. 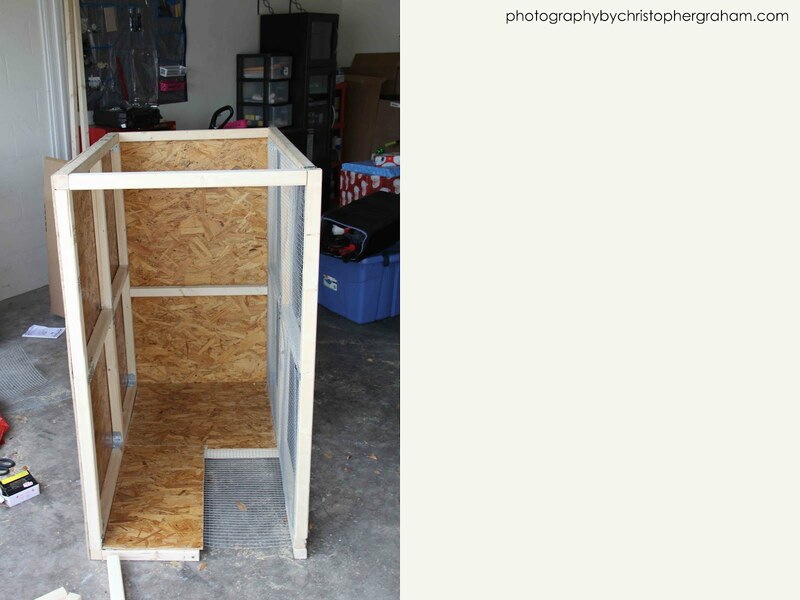 Purchase a $20 small animal playpen. 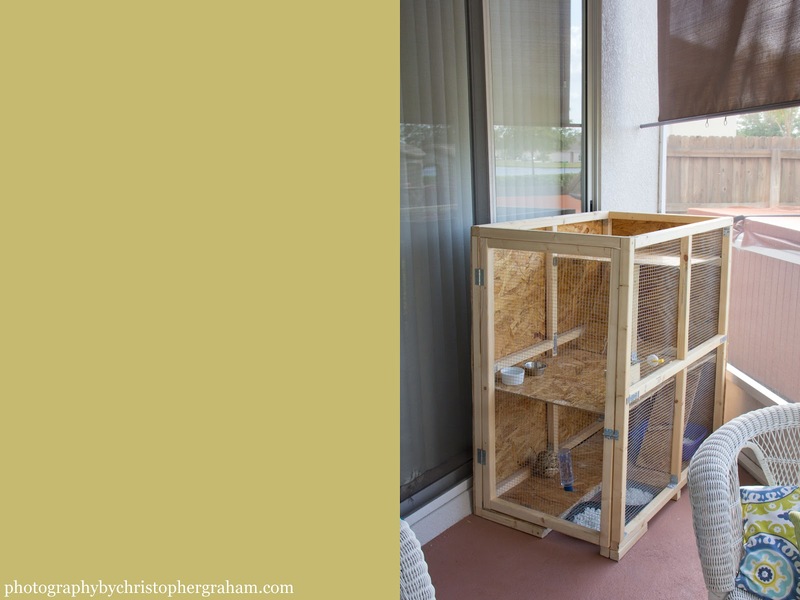 They have panels that can be removed or added to make the cage as big or small as you need. 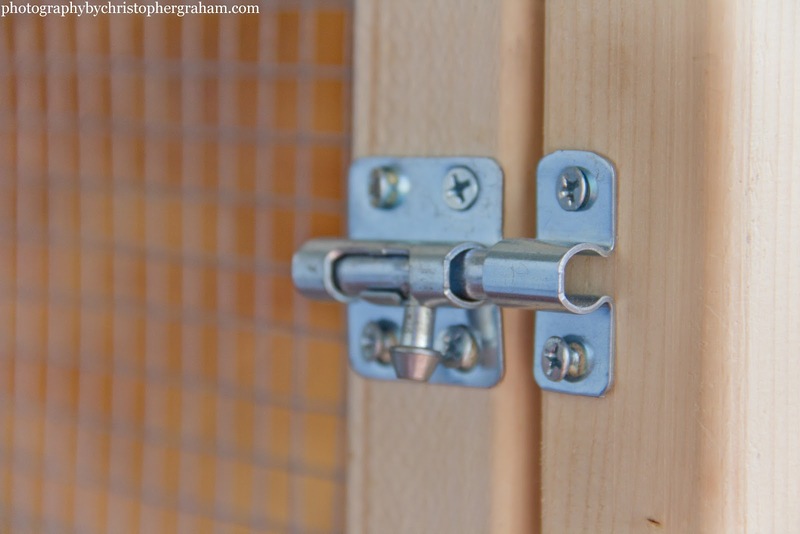 The top is open but the sides are high making it difficult for animals to escape. 2. Purchase a $2 tarp from Walmart. 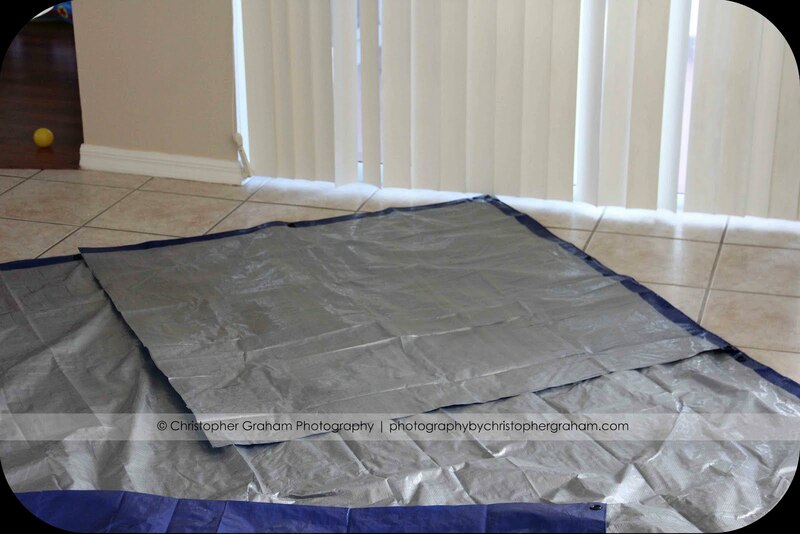 Cut a piece of the tarp to fit the width and length of the playpen. Actually cut it a little bigger so it will stretch a little ways up the sides of the playpen. 3. 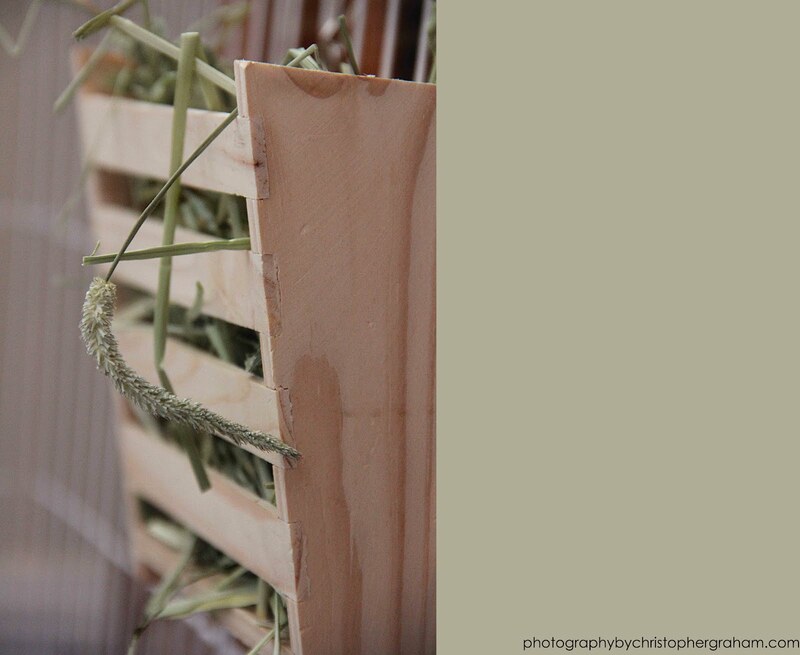 Add some finishing touches like a hay manager, salt wheel, paper shavings, somewhere for him to snuggle, and you're good to go. I don't have a picture of the final product but his cage took up a whole entire corner of Matthew's room. You would think Bob the Bunny would be happy with his larger than life cage. 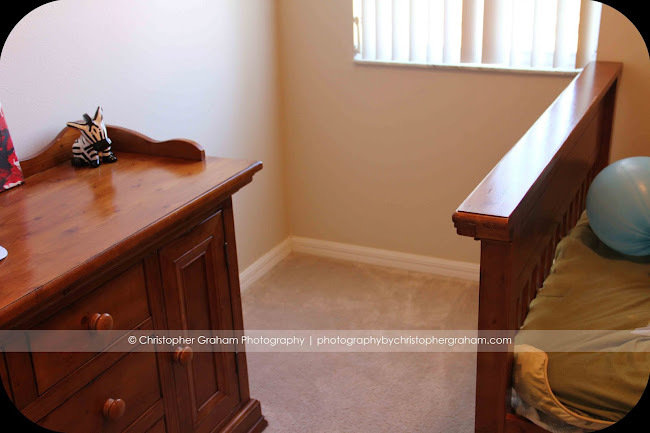 I was watching TV one night and heard a strange noise coming from Matthew's room. I walked in and there he was. Bob. On Matthew's bed. Homeboy straight scaled the sides of his cage. He was just sitting there on Matthew's bed looking at me with his beady little red eyes. I could see his thought process.....Yeah lady, that's right. You can't hold me down. Catch me if you can, I dare ya. No, check that I double dare ya. Oh yes, I stared at this bunny and that entire conversation totally went through my head. Remember what I said, I always get the weird animals. 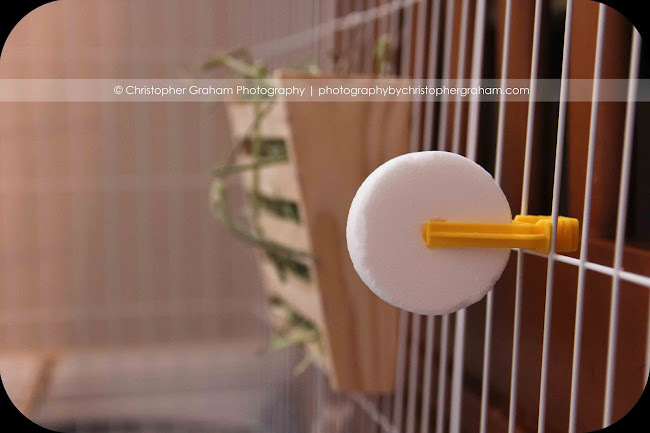 Most people would say to just get a rabbit cage with a top and call it a day. Well that's what my husband said at least. I don't like a lot of the cages out there. I think they are too small and cruel. The huge ones sell for $200 bucks or more and I'm not going to drop that kind of money. So I had to go with Plan B. 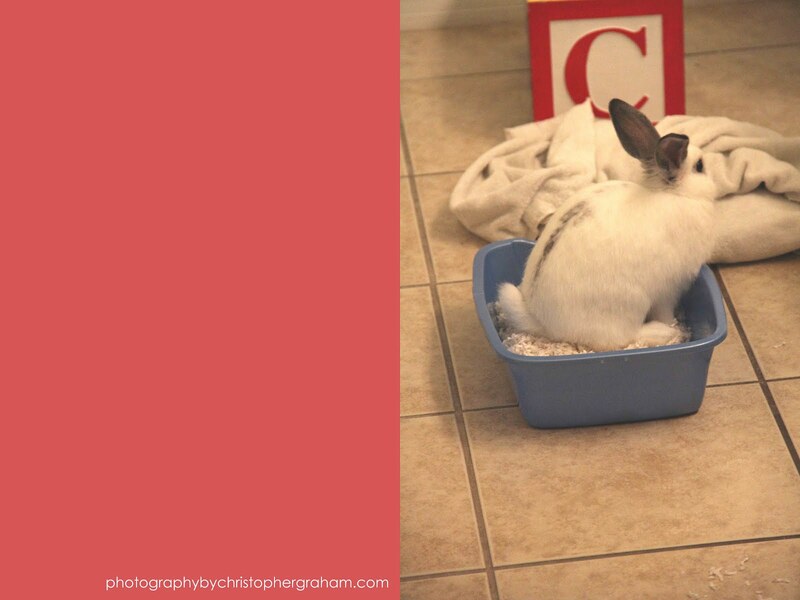 If Bob the Bunny was going to be hopping around freely, he needed to be potty trained. What's that you say? 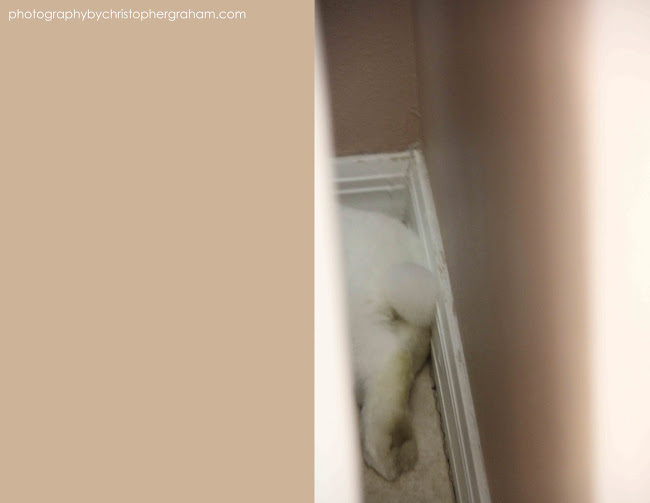 Potty train a bunny? Yes ma'am, that's right. What? You don't believe me? It's not like litter training a cat. You have to place boxes in areas where your rabbit likes to go. We have one in the dining room, the bathroom, on the lanai, in Nicholas's room and in his new cage. Thankfully most of them are somewhat hidden and Bob's litter doesn't stink, make too large of a mess and is super simple to clean. Much easier than a cat's litter box. So I thought I could rein Bob in by litter training and strategically placing baby gates throughout the house. One afternoon the cats were sitting outside the laundry room acting all funny. I step over the baby gate and this is what I find. Bob hopped the baby gate, took over the laundry room, and now thinks he is a cat. Chloe and Galina get along with Bob but not when he is eating their food. And occupying their space behind the washer and dryer. We can keep a pretty good eye on Bob when we're home but I don't want him in the laundry room when we're away. If he chews through the power cord to the washer or dryer.........no bueno. It was time for Plan C. Use the litter boxes and baby gates and design a large cage fit for a rabbit king. So it began. I've never attempted to build a structure that needed to be somewhat structurally sound. So what better way to start than by designing a 3 story bunny cage with a built-in litter screen, hinged door, ramps and a sleeping loft. I mean go big or go home, right? Keeping true to my style it needed to be inexpensive. My goal was to learn how to use a circular saw, utilize metal ties and connectors, make minimal measurement mistakes, and come in under $70. Done, done, done, and not so done. My final cost was $102. Not my idea of cost effective but at least it was cheaper than buying a wood, tri-level bunny cage. The whole process took me a week. I could lie and say that it took so long because I had to take care of my kids while trying to work power tools but I'll be honest. There were so many times I just sat there thinking how in the f*** am I going to make this work. My final product looks nothing like the original sketch but hey, it's done. Well, almost. I still have to finish the top. First up was the frame. I had planned to use hard wire cloth for all four walls. After completing one side I realized that it was going to take a lot and that mess is expensive. 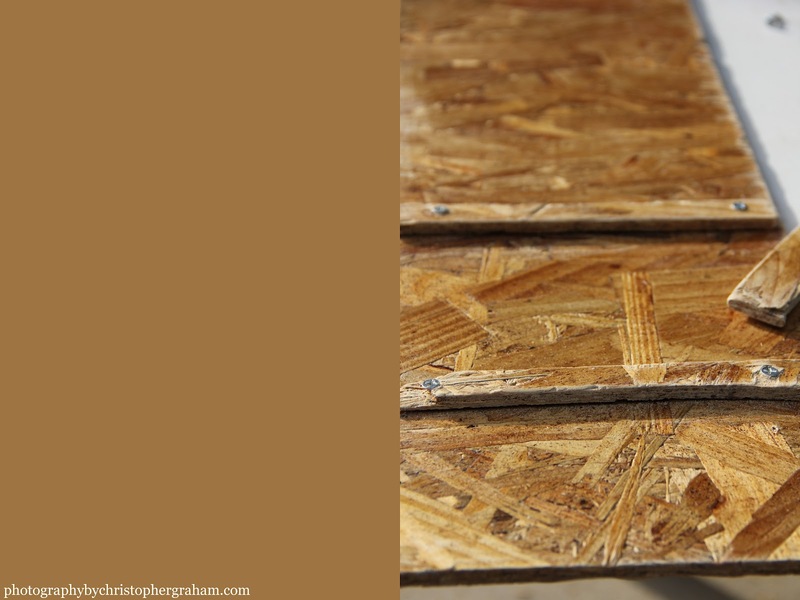 Enter OSB board to the rescue at $6 for a huge slab. Not so cheap to polyurethane but it had to be done. I didn't want urine soaking into the boards....gag. Of course my clumsy self spilled a can so I had to buy another one. Then I sat down again and thought how in the hell am I going to do a built in litter screen so that I can slide a litter pan in and out from under the cage. I added some extra 2 x 2's underneath so the entire structure would sit off the ground giving me the space I needed to slide a thin litter pan in and out. I wish I could provide detailed instructions just in case someone else wanted to attempt this bunny cage but I was simply going with the flow. I went where ever my thought process took me and somehow, someway, it worked. Yes, that is Bob happily staying in his cage even though the door is open. Yes, it is now May (I started this back in Feb.) and I haven't finished the top and yes, as of right now those are my pie pans serving as the litter box. No need to fret, it will one day get done. I still consider this project a total success. I learned to use a circular saw which to this day still scares me. I have a tendency to not pay close attention and the finality of the blade coming into contact with a finger.....well it still crosses my mind every time I take the saw out of the box. I've conquered the weird feeling of intimidation that the wood section of Lowes used to instill in me. Don't deny it ladies. You know you've felt that way at least once. 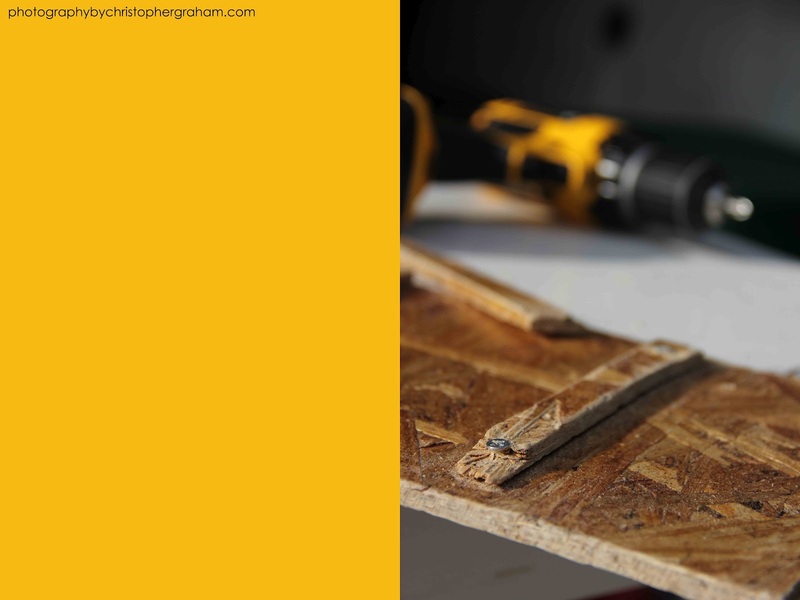 I now know the awesomeness of ties/connectors which are extremely handy when attaching multiple wood pieces at different angles. 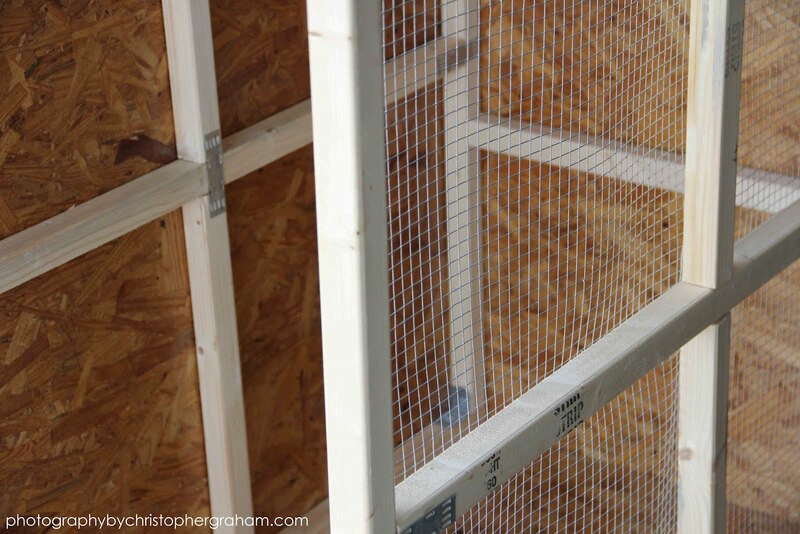 And lastly, I've learned about chicken wire vs. hardwire cloth. It doesn't seem like a big deal but go ahead and run your hand over chicken wire and then drag your hand across hardwire cloth. Now imagine an animal's nose or foot dragging across and tell me which one you would choose. I'm just say 'in. I'm sure people from Pinterest will stumble across this post and possibly be aggravated when they learn that I don't offer detailed instructions on how to make this bunny cage. My advice? You. Don't. Need. Them. 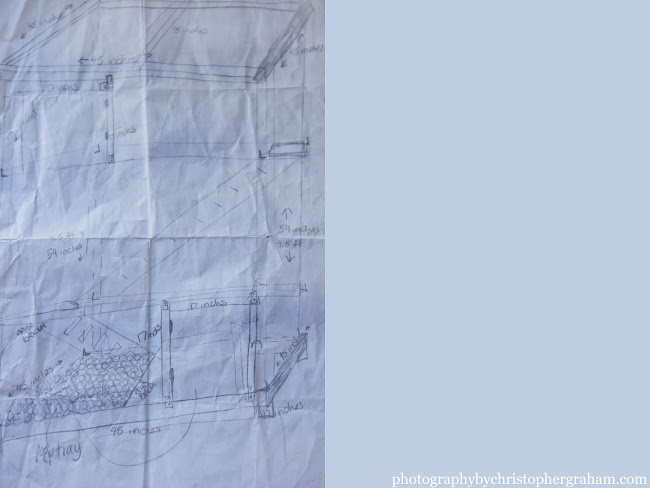 Grab a cup of coffee, pen, paper, and start sketching what you want and go from there. Looks nothing like my original sketch and I'm OK with that. Have a great weekend!